This is so easy, it’s hardly a recipe, more just an idea to have as a healthy snack or serve instead of nuts pre-dinner. I’m always starving when I come home from work but have two young, crazy children, so dinner does not happen for a while. 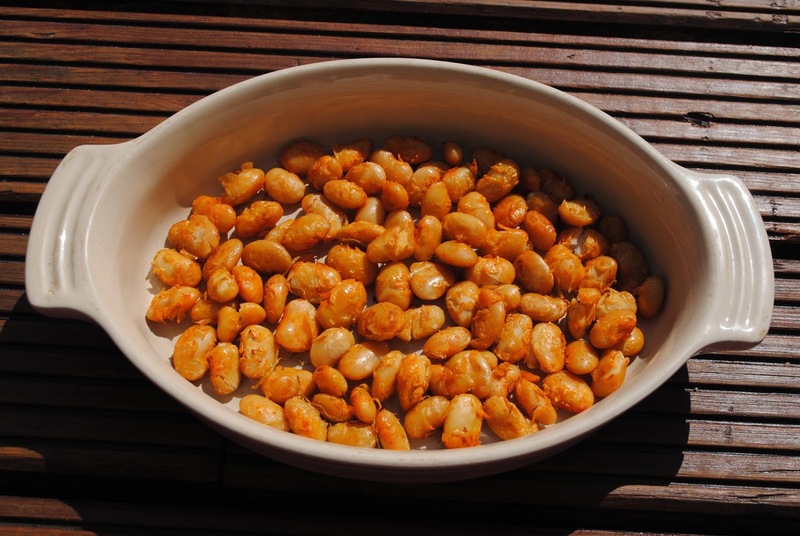 This snack is great; it only takes a minute or two to open a tin of butterbeans, rinse and throw in an oiled baking tin. And needs no stirring or regular checking! Put the oil into a baking dish, pop into the oven to warm whilst you rinse the butterbeans well. Put the butterbeans into the dish, add the cumin, smoked paprika and salt. Mix well. Cook for 20 minutes; just before you take the dish out from the oven, add the lime zest and lime juice and cook for 5 more minutes. Wow!That is such an addictive snack with a burst of flavors!Thanks a bunch for sending it across to MLLA.